Today laser is the most obvious and superior choice of treatment for Permanent Reduction of unwanted hair. 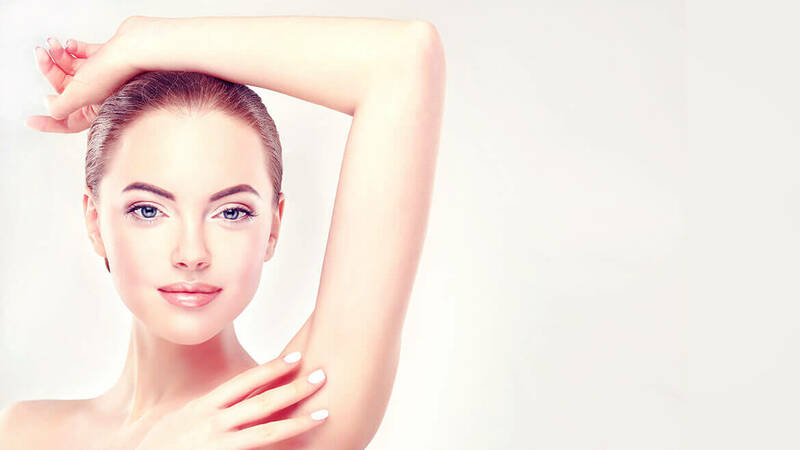 Laser hair reduction allows for a lesser and finer or vellus hair regrowth, and multiple sittings at appropriate intervals which match body area hair growth cycles can give a fantastic result. The lasers we use are the Gold Standard for hair removal as quoted by Dr Fitzpatrick in Dermatology. Additionally, our extensive knowledge of laser physics allows us not only to treat thick dark hair but also treat finer, lighter hair and in certain cases we also treat hair without shaving. We pride ourselves in being pioneers in this technology and we know how to visibly better skin appearance alongside hair reduction. This involves a deep study into laser technology in its entirety and not just as a routine beauty procedural technique. Laser simply means a light of a fixed frequency which is made more efficient by passing through a medium and being emitted from the handpiece. This is selectively absorbed by the hair only, and depth is limited by the follicle. Unlike radiation it does not penetrate beyond superficial skin structure making it a safe option in pregnancy, breastfeeding and most systemic conditions. However, laser affects only the hair which is in a growing phase and hence repeated sessions are required for permanent reduction of hair growth – therefore appropriate intervals between sessions is important. We do not look at financial gains but at patient satisfaction – that is our reward. At our clinic, we have a variety of laser technologies all up to the mark for great results and certainly no burns. Hence there is no standard routine, instead we recommend laser as per the individual patient after assessing skin colour and hair type. We use air cooling technology alongside our lasers to minimise discomfort and cool the skin. This goes a long way in minimising chances of minor skin scalds. The high-powered 755 nm Alexandrite wavelength is the Gold Standard in Hair reduction. The wavelength is selectively absorbed by the Melanin and Vascular structure in the Hair root and bypasses the Epidermis hence minimises chances of burns or scalds. It has proven long-term results for not only Hair reduction but also in pigmented lesion removal and vascular lesion removal. It permanently reduces hair by an average of 79% after just three treatments if done at the right intervals and under optimum hormone control. The 1064 nm Nd:YAG is the safest wavelength for permanent hair reduction on darker skin types and tanned skin. We use it mainly in skin type 5 and in certain cases of concomitant pigmentation and open pores. We also have combination lasers with Alex and NdYag. Laser diodes are the most common type of lasers for hair removal. A laser diode, (LD), injection laser diode (ILD), or diode laser is a semiconductor device similar to a light-emitting diode in which the laser beam is created at the diode’s junction. We offer the Painless Soprano Diode Laser especially in cases of non-tolerant patients and our younger patients and teenagers.